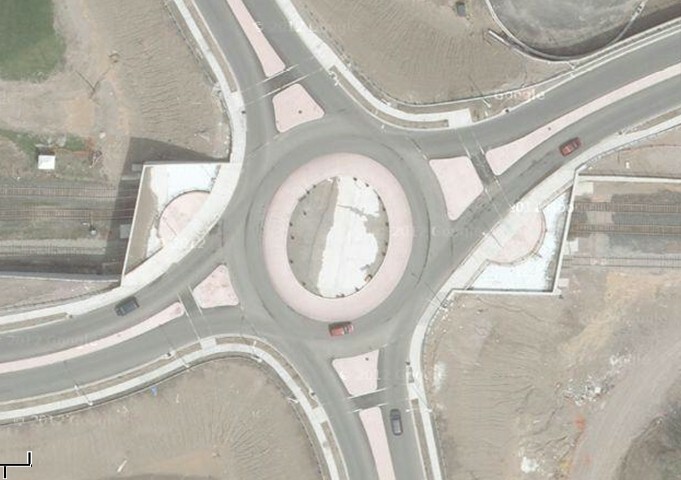 London Ontario built its first roundabout a while ago, at the intersection of Hale and Trafalgar. I think it has quite handily dealt with the railway crossing and traffic tie-ups that used to characterize that spot. Here's a picture! I recently saw a cyclist (sorry, no video) riding to the right of traffic in this circle.﻿ They got through OK, but I sure don't want to see it again. 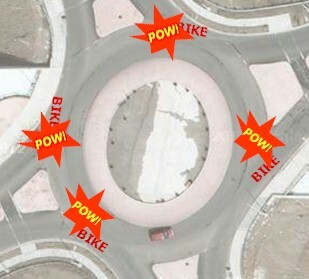 As I see it, roundabouts are characterized by one main thing: everybody keeps moving. For the cyclist to the right of traffic, this means that they are, in effect, intentionally riding in a right hook machine. The cars in the circle are under constant pressure from behind to keep moving and exit to the right as soon as possible. When you commit to really taking the lane, roundabouts work great! One thing about roundabouts is that they're super if you're in or on a vehicle. They are not much fun for pedestrians. If you are uncomfortable taking the lane on your bike, I get that. Get off and walk it for roundabouts. I'm thinking, though, that a busy roundabout is more stressful that way than my way. If you can make an exception and at least take the lane in roundabouts, that would rock. You might even start thinking about other places or situations where doing it makes things better for everyone. In the case of roundabouts, however, a bunch of normal sharrows smack in the lane would be a great cue telling cyclists where they ought to be. I might even ask the City to do it, which would be quite out of character for me; I am typically a rather lame excuse for an invested citizen. PS - Did you know that "Although the term roundabout is sometimes used for a traffic circle even in the United States, U.S. traffic engineers now make the distinction that in a roundabout entering traffic must always yield to traffic already in the circle, whereas in a traffic circle entering traffic is controlled by Stop signs, or is not formally controlled, although some states are exceptions, notably New York, which follows the "yield" rule although naming them Traffic Circles."? (source, wikipedia) I didn't! Mighk was good enough to let me know in the very first comment and I have corrected the post accordingly, taking out most mentions of "traffic circles". Thanks Mighk! When I give out bad information I want it to be intentional, dammit! Mighk - Crap! I really didn't know there was a difference. If anything I thought Europeans called them Roundabouts and North Americans called them traffic circles, which I now see ain't exactly so. Thank you, nice catch. Post and video title corrected. Aren't they also called "rotaries" some places? 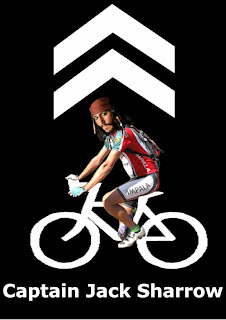 Either way, except for the giant ones that encourage high speeds, an assertive cyclist can easily get held up by those poorly handling motor vehicles. Speaking of which did I say, er, thanks for this needed post and I'm envious you did it first. Is that better? Steve - That was perfect. Thanks for that comment. I really enjoy your comments. My take on terminology: when I was a wee sprout and mah daddy was learning to speak Charlie's language to better win the hearts and minds, they called them traffic circles in Fayetteville, NC. When I got to New England for my VA benefits-subsidized post secondary edumacation, they were rotaries, and out here in the car-sub-urbs (as with Australia and Scotland) they call them roundabouts. In France I don't know what they call them, but motorists there take a break from blazing by you at 60kph with a 2 metre passing distance and happily sit behind you because they know it's only 7 seconds until they can step on it again. JAT - Ah Oui, j'ai bien reçu votre e-mail. Your smart phone was smart this time and I got the awesome picture too... bike supported maple syrup in front of the winning tree (I think)? Il est parfait! I just wish cars would only be doing 60kmph and pass at a 2m distance. Luxury! Often, I get buzzed at less then half a meter by arses doing 80 plus. 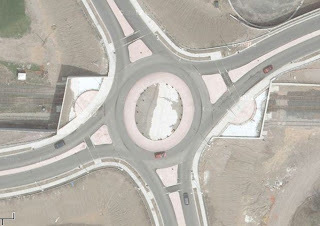 We have tonnes of these roundabouts in Kitchener-Waterloo and as long as you are assertive and think (and do what the rantmeister did) you are fine. Monsieur de la Rantwique? Rantmeister? Fantastisch!